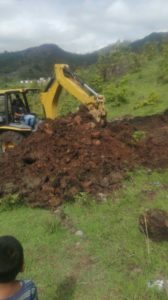 Today was our first day with some serious backhoe work in starting our next house project with a family in need of affordable and adequate housing here in Honduras. We needed to use a backhoe to get the project started because of the slope of the lot being somewhat excessive. This extra work with the backhoe will add an additional 10% cost to the project. To some of you it doesn’t seem like much but to a family living on a limited budget in Central America its a lot. Psalms 127:1 says, “Unless the Lord builds the house, the builders labor in vain. Unless the Lord watches over the city, the guards stand watch in vain.